↑ Global Tiger Initiative. (2011). 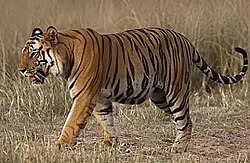 Global Tiger Recovery Program 2010–2022 互聯網檔案館嘅歸檔，歸檔日期2011年8月26號，.. Global Tiger Initiative Secretariat, Washington. ↑ Sangay, T., Wangchuk, T. (2005). Tiger Action Plan for Bhutan 2006–2015. Nature Conservation Division, Department of Forests, Ministry of Agriculture, Royal Government of Bhutan and WWF Bhutan Programme, Thimphu. ↑ Gupta, O. (2006). Encyclopaedia of India, Pakistan and Bangladesh. Delhi: Gyan Publishing. 第 313頁. ISBN 8182053897.